The industrial gas industry has been at the forefront of consolidation for the past two decades and is now highly concentrated. The merger of Linde and Praxair saw the ﬁeld being narrowed down to three major players—Air Products and Chemicals, Inc. (United States); L’Air Liquide, S.A. (France); and The Linde Group PLC (United Kingdom). Together, these companies supplied more than 60–70% of the industrial gases business. Primary factors aiding the growth of industrial gases in recent years have typically been the growth in the Asian economy, high energy cost, and climate change initiatives. Increasing demand from the iron, steel, and chemical industries, as well as for gasiﬁcation of coal and coke for clean energy, is expected to increase demand for industrial gases signiﬁcantly after the current depression in the oil markets. With the developing world continuing to consume large quantities of steel to improve infrastructure, demand from those regions is positioned to grow at above-normal rates. 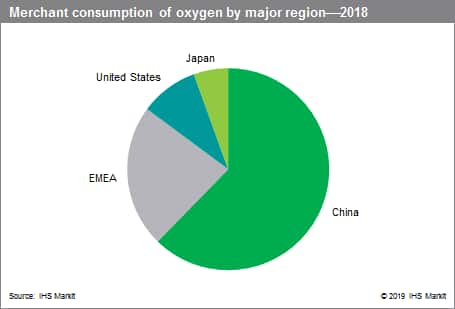 The following pie charts show merchant consumption of oxygen and nitrogen by major region. The last few years saw the general markets underperforming and this affected the industrial market directly. However, when global growth picks up, especially in Asia and Latin America, growth for the industrial gases market is expected to revive. Sectors for which growth is increasing, albeit from a low base, are healthcare and biotech. Increased growth is also expected for the semiconductor industry, which is seeing its fabs shift to 300 millimeters, and rapid advancement in the photovoltaic technology. The Chinese industrial gas market has almost doubled in value in the past few years. Consumption volumes in India and South Korea are also expected to double in the next few years. Demand from petrochemical, chemical, and reﬁning operations is making the Middle East a signiﬁcant player. The emerging economies in Eastern Europe are also creating a major market, along with the major South American countries. The current market is cautiously optimistic. Global GDP growth, which was growing at an average of around 3% during the past three years, is expected to cool down during the next few years, although not by much. Slower-than-expected production growth is likely to lower overall sales; however, areas such as food, beverages, and healthcare are expected to grow strongly. Most of the major gas companies have reported earnings declines due to manufacturing weakness coupled with currency impacts. The growing chemical manufacturing sector has led to increasing demand for industrial gases. Increasing usage of gas blanketing as well as reﬁnery applications have also been contributing to the rise in the use of industrial gases in these segments. Demand for medical gases in the healthcare and medical industry is also growing, especially in the Asia Paciﬁc and Latin American regions. 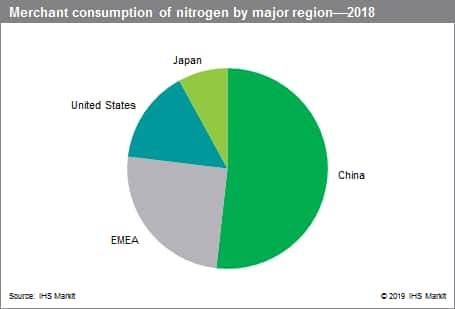 With the increasing use of liqueﬁed gases such as LNG, there is rising demand for gases such as nitrogen. Consumption in the food industry is also picking up, where health-conscious consumers are demanding fewer additives and safer and fresher food products and where gases can be substituted for chemicals.